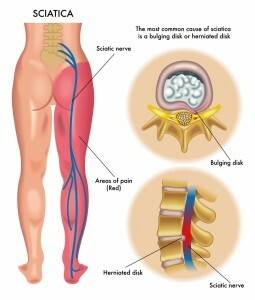 Nagging, shooting pain that travels down the back of the leg is the main symptom of sciatica, or sciatic nerve pain. Sufferers that deal with the daily pain of sciatica know the frustration of finding an effective, drug-free source of relief as its recurring symptoms can flare up without warning and can be a daily occurrence. Sciatic nerve pain is different than other sources of back pain in that the compression of the nerves in that particular part causes pain to travel along the nerve paths, often involving the thigh area and possibly extending all the way through to the foot and toes. Finding relief through natural means often takes some trial and error but is possible with tenacity and practice. Your chiropractor in Leawood can help develop a strategy for treatment that can effectively reduce your pain for the long-term. Chiropractic Adjustments – Regular chiropractic treatments that target the irritated nerves of the sciatic area has been shown to be highly effective in the treatment and relief of sciatica. Whether the disorder has been caused by a trauma to the back or through problems caused by bad posture or repetition trauma, chiropractic care allows the nerves to relax and releases the area of ongoing pain signals. Yoga – Exercising between your chiropractic adjustments is key to sustaining good back health and keeping sciatic nerve pain from flaring up. Yoga and stretching have been shown to be of particular help to those who suffer from sciatica by relieving aggravated nerves while creating more strength and flexibility. Acupuncture – Proven to be a highly effective treatment for all types of recurring or chronic pain, the ancient Chinese method is used by many holistic health practitioners to help those who suffer from sciatica as well. By working to open the flow of the body’s natural sources of energy, acupuncture’s benefits have even been supported by the Federal Drug Administration. Coupled with chiropractic care, acupuncture has been shown to be extremely helpful. Massage Therapy – Also seen as a complement to chiropractic adjustments, massage therapy helps to relieve aggravated muscles, helping them to not overly react to the negative stimulus sent by compressed nerves. By gently relaxing tired, over-stimulated muscles, your massage therapist can help you find relief from your sciatic nerve pain. Regular massages can help relieve a number of health issues with relief from sciatic nerve pain topping the list for many sufferers. Through these integrative methodologies, we have seen many patients find drug-free, natural relief from the chronic pain of sciatica. If you’ve experienced recurring pain that seems to travel beyond your lower back, schedule a consultation with us at Adjust Your Health Chiropractic. We can help you determine if sciatica is in fact causing your back pain and establish a plan for treatment. Please call our patient care team to schedule your personalized appointment now to take advantage of our $47 New Patient Exam offer. We’re available in Leawood and Overland Park at 913-681-7757.